The winding paths to Food Democracy converge in Frankfurt — Food Democracy Now! ... how? The second annual Vernetzungskongress der Ernährungsräte (Congress for German-speaking Food Policy Councils) kicked off on November 23, 2018 with an introductory event at the Museum für Kochkunst und Tafelkultur (Museum for Culinary Art and Dining Culture) that gave the gathered citizens/eaters/activists a taste of regional culture with locally-produced Frankfurter sausages, “hand cheese with music” and apple wine. The Congress continued throughout the weekend at Frankfurt’s Dominikanerkloster (Dominican Monastery) where all of the more than 150 attendees contributed creativity, imagination and lived experiences towards defining, planning and strategizing Food Democracy. Below are my takeaways from the weekend. As the alternative food movement has continued to grow and connect more eaters and farmers across the world in the past decades, the question of how to bring alternatives to the mainstream has been ever present. Notions of ‘mainstreaming’ or ‘upscaling’ alternatives can give food activists the sneaking suspicion that their steadfast principles will be watered down and domesticated by technocrats, or instrumentalized by greenwashing companies and politicians. The Saturday session of the Congress gave some indications that this polarity could be starting to fade. 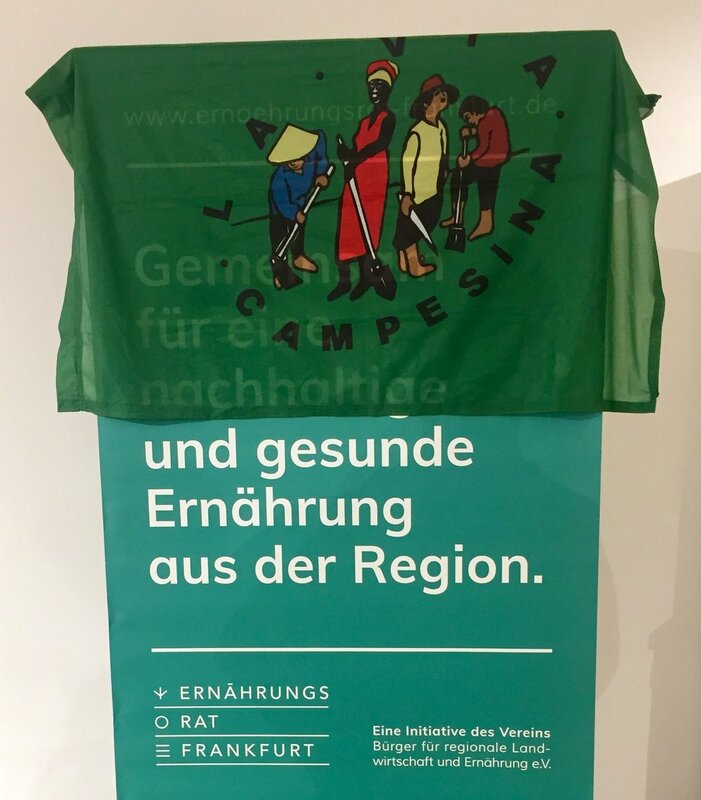 Nik Hampel, who together with his wife runs a family-owned beef farm in Vogelsburg just outside of Frankfurt, showed solidarity with the Food Sovereignty movement by draping the La Via Campesina flag over this Frankfurt Food Policy Council poster as he took the stage Friday evening for an open panel discussion. Saturday’s gathering was commenced by rousing speeches from regional politicians: Priska Hinz (the state of Hessen’s Minster of Environment, Climate Protection, Agriculture and Consumer Protection) and Rosemarie Hellig (the city of Frankfurt’s head of the Department for Environment and Women). Both spoke with passion about the transformation of agriculture and food systems toward justice and sustainability and underscored their support for Food Democracy and Food Policy Councils (FPCs) — and it wasn’t all talk. Initiatives like the agricultural Ökomodellregionen (Ecological Model Regions) led by Hinz are currently underway in twelve out of twenty-one counties in the state of Hessen. Meanwhile, Hellig is an active patron of the Frankfurt FPC and helped to get the citizen group a seat at the Round Table discussion that will make decisions about the food strategy for Frankfurt schools. For the Congress’ keynote speaker — Olivier De Schutter, the Founder of the International Panel of Experts on Sustainable Food Systems — these examples of linking the grassroots with actors in (local) government are crucial for achieving lasting transformative impact in the food system. De Schutter challenged the FPCs in attendance to overcome false dichotomies between ‘the alternative’ and ‘the mainstream’, and act as agents of political imagination by redefining the relationships between actors in the food system with mainstreaming real sustainability as a key objective. Although the extent of serious problems in the current food system is crystal clear, solutions likely require unconventional mixed formulas and must be approached with nuance. For example, just because for-profit entrepreneurial logic can’t solve all problems and serve all community needs, doesn’t mean it can’t solve many. How can those operating on the non-profit logic of co-operatives, food sharing, and de-commodified food production better join and symbiotically coexist with the for-profit entrepreneurial logic of small producers, retailers and professionals to create long-term viable solutions? Moreover, absolute direct and deep democracy is not necessarily feasible or even desirable. How can civil society groups connect different modes of exercising politics and create hybrid forms of democracy between participation and representation? What new modes of governing could give citizen associations a more direct influence on the frameworks, values and priorities that define institutional approaches and decision making, while safeguarding principles of representative democracy? These are all questions of interest going forward, which demand plenty of subtlety, imagination, experimentation and (social) innovation. Overcoming dichotomies and redefining relationships will require a new story, a new narrative that allows activists to connect and engage with a wide audience of eaters. Saturday’s schedule gave citizens and representatives of the more than 28 FPCs in attendance — which included groups from Luxembourg, Austria, Switzerland and the Netherlands in addition to the German hosts — a platform to begin to formulate these new narratives by opening up the floor for each group to tell their stories, motivations and experiences of founding FPCs. After placing an ‘offering’ of a locally-produced product from their region, each group discussed challenges and successes they have encountered thus far. The different FPCs, most of which have been formed within the past two years, have already undergone a wide variety of experiences. Some groups, like the hosts in Frankfurt, have developed a strong connection to local government and have already begun to engage in meaningful participation. Others like the group from Wiesbaden have encountered mixed reactions to their mission of re-localizing food, as the city looks to expand development and is offering hefty sums to urbanize agricultural land, incentivizing regional farmers to cash out. This shows that there is no one path that leads to the horizon of Food Democracy. Context matters and the path is winding. However, the afternoon’s keynote speakers provided the Congress with some inspiring success stories. Kenneth Højgaard from the Kopenhager Food House spoke about his initiative which has transformed public institutional kitchens in Copenhagen (including schools, hospitals, etc.) from low-quality, unappetizing and highly processed food to 89% organic and from-scratch preparation in the past ten years. Kenneth has inspired lackluster kitchens all over the city to smoke their own salmon, bake their own bread and freshly process their own meatballs — and the food is so good now that the cooks themselves even eat it! Lori Stahlbrand from the Toronto Food Policy Council spoke about the people-centered food policy that she and her husband Wayne Roberts have developed over the past three decades in Canada. Lori’s talk foregrounded food as a linchpin for every city looking to mitigate and adapt to climate change. After many years of hard work, Lori and Wayne’s ideas have been integrated into Toronto’s government with the Toronto Food Charter in 2000 and they encouraged FPCs in attendance to follow suit and position themselves as solutions for a variety of (urban) problems. Lori, now a municipal employee, leads a Food Strategy team for the city of Toronto which has spurred countless food projects and initiatives around the city. The Congress was wrapped up with several “Open Space” assemblies on Saturday evening and Sunday morning. These assemblies — which any member of the audience could propose in a one minute pitch — gave citizens the chance to brainstorm and network while digging deeper into their experiences and aspirations. The many topics ranged from ‘Diversity and Participation’ to ‘Internalizing Externalities’. In the final session of the Congress the floor was opened up as a few of the central members of the initial FPC movement in Germany presented the Frankfurter Erklärung der Ernährungsräte (The Frankfurt Declaration of the Food Policy Councils) to the rest of the group as a signatory moment that would define where the many groups converge and explain the purpose of FPCs and the event to the general public and media. However, many of the participants were dissatisfied that they were not informed earlier about the Declaration, and were upset that they did not have a chance to contribute to editing the document in advance. Though the conflict ultimately reached a compromise with everyone agreeing to sign the Declaration with some minors changes, two things were made clear: 1. Citizens take FPCs and their activist missions very seriously, and 2. Democracy can be messy. A blog documenting the PhD research of Stephen Leitheiser.